In the 1990s, Microsoft had a problem: Windows seemed to suffer from endless security problems that hackers and other online villains were quick to exploit. One way to fight back was to install a firewall – an app that blocked malicious and/or unwanted network traffic and that could ensure that dodgy software couldn't sneak onto your PC. So Microsoft began building its own firewall into Windows, but there has been ongoing controversy as to its robustness as a ‘best solution’, or whether it's merely just good enough. That remains the case today, with the potential for cyber-attacks still very much a danger, and the promise that third-party software can make your system even more secure. These are the firewall apps we think you should consider using no matter which version of Windows you're running. Most of us run a hardware firewall on our router, and a software firewall on our Windows PC. Some antivirus providers bundle a firewall with their free antivirus software, while others only include one with their premium security suites. Here we’re looking at firewalls that can be used alongside your regular antivirus software. For many of us, ZoneAlarm Free Firewall 2019 was the app that introduced us to firewalls in the first place, and it was a must-have app back in the days when Windows effectively told the internet "Hack me! I'm easy!" The current version of ZoneAlarm Free Firewall hides open ports, identifies potentially dodgy traffic, disables malicious programs and connects to DefenseNet, which provides real-time security updates as new threats are detected. It also protects your computer on public Wi-Fi networks, and offers 5GB of online data backup via IDrive. When you're installing the software, read through each step carefully if you don't want to set Yahoo as your default homepage; the 'Customize installation' option is quite well hidden. You'll also need to submit an email address to activate the firewall, though ZoneAlarm promises not to share it with any third parties. If that isn't an issue for you, ZoneAlarm Free Firewall is the best free firewall you can download. It’s worth taking your time when installing Comodo Free Firewall because it comes bundled with an extra browser, and if you click through too hastily you might find that it's installed itself without you realizing. Comodo Free Firewall will also offer to set Yahoo as your homepage, but the checkbox is much easier to see and untick than ZoneAlarm's. 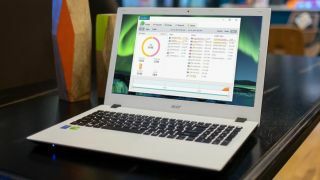 It will also suggest making its own secure Comodo Dragon your default browser and importing your settings from Chrome. You can't opt out of installing the browser, but you can choose not to use it. GlassWire is a slick looking free firewall that shows you exactly which programs are sending and receiving data over your network, and how much, making it easy to identify anything unusual. There's a huge amount of information available, which might seem alarming at first, but you can clear all of GlassWire's logs in a few seconds. You'll be notified when a new application or service wants internet access, and you can allow or block it with a single click. In actual fact, GlassWire is really just an interface built on top of the Windows firewall, so while certainly more attractive (and informative) than the latter, it’s not going to be any more robust. The premium versions of GlassWire includes some extra features like monitoring of your webcam and microphone, storing records for more than a month, and monitoring multiple remote connections, but for basic use the free edition is superb. TinyWall is better known for what it doesn't do than what it does: unlike some free firewalls it doesn't interrupt you with pop-up warnings about what seems to be every second bit of data. TinyWall (now on version 2.1) is designed to improve Windows' own firewall features without requiring any expert knowledge, and while it offers the same whitelisting features as other packages – to ensure that the apps you use can get online without any difficulty – it does it through hotkeys or lists rather than pop-ups. TinyWall lives up to the ‘tiny’ part of its name, and only takes up about 1MB on your hard drive. It is certainly a very useful addition if you decide to stick with Windows' built-in security tool. OpenDNS isn't a downloadable free firewall; it's a change you can make to your router's settings so it connects to the internet via OpenDNS' servers. That means the protection applies to any device on your network, which is useful in today's hyper-connected homes and businesses. OpenDNS Home automatically blocks known offenders and offers a range of content filtering options to keep the kids away from filth, too, and it helps prevent phishing attacks. The service is free, and there are full setup instructions for every kind of device. For more info on this solution and other alternatives, check out our guide to the best free and public DNS servers of 2019.